Jane Martin and Ted Hunt (PDSH link) have an origin amazingly suitable for space adventurers in 1940. Jane's father Matthew (an engineering professor at Midtown Technological University in Dogwood City, by the way) invented a rocket ship. His co-builder was Ted's older brother Douglas. There was a trial journey slated to go to the moon. Well, wouldn't you know it...some secret agents/gangsters came to steal the ship, and Jane was forced to make a quick decision to save her father's work. 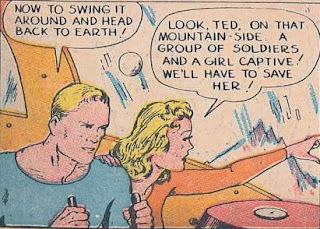 She blasted off with only Ted accompanying her, and they proceeded to have a series of thrilling adventures as the Space Rovers! Their tales are pretty much what you'd expect from comic book planetary romance in the early 1940s. I think these stories and tropes are colorful and fun and could read them all day. True to the era, the Space Rovers seemed to focus mostly on our own solar system, landing on Mercury in their very first adventure. Their Dogwood City-originating versions will almost certainly need to venture beyond the mundane confines of our little patch of planets. Looking at the picture, the water slith just looks confused to me. I bet he's actually a nice guy. Haha! I dunno man. Don't let the googly eyes lure you into a false sense of security.